In the end, AzhwAr says “Those who learn this decad will reach SrIvaikuNtam and will eternally enjoy emperumAn there”. magizhvu eydhuvar – will remain blissfully. nammAzhwAr always having the desire in his mind that only the divine feet of our lord who is resting on thiruvananthAzhwAn are our upAyam and mercifully spoke these distinguished ten pAsurams among the thousand pAsurams in the form of anthAdhi. Those who can practice this decad will forever remain blissfully in the great spiritual sky, SrIvaikuNtam. nAgaNai … – That, the divine feet of sarvESvaran who is having thiruvananthAzhwAn as his bed, are the means for us. Since ananthaSAyithvam (resting on AdhiSEshan) is a characteristic of the supreme lord, here AzhwAr indicates that the supreme lord is the refuge (Here, it can be said that AdhiSEshan’s purushakArathvam (being the recommending authority) is highlighted [highlighted explicitly in 24000 padi]). 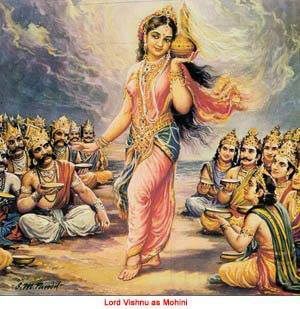 Only those who are part of her (SrI mahAlakshmi‘s) entourage, can do purushakAram when emperumAn remains the upAyam. The bed (AdhiSEshan) is available in the antha:puram (private quarters) [where SrI mahAlakshmi resides]. nam pirAn – One who is the benefactor for his devotees. saraNE saraN enRu – [charaNE SaraN] By the avathAraNam (exclusivity – “E” in saraNE), upAya nairapEkshyam (bhagavAn not accepting any one/thing else as means) is explained. AzhwAr‘s nature is such that even when tormented by materialistic sufferings, he will never give up the core principle. Not engaging in any other means is explained as mahAviSvAsam (unflinching faith). With this, “Eka” word [of SrI gIthA charamaSlOkam] is explained. nAL thoRum Eka sindhaiyAnAy – Eliminating other thoughts, having a singularly focussed mind. Those who go in search of wealth, remain faithful on a ship for four years, ten years etc [in those days, merchants travelled in ships for long duration], and if we look at the benefit that is received [that is, kainkaryam to bhagavAn], should we not have as much faith [in bhagavAn]? The true nature [of a jIvAthmA] is to remain faithful even when tormented by worldly pains which is natural for this material world. kurugUrch chatakOpan mARan – His [AzhwAr‘s] birth [in AzhwArthirunagari] is the root cause for all his firm faith. Aga nURRu andhAdhi – Those who can recite and practice this decad which was recited by AzhwAr to sustain himself. mAga … – in SrIvaikuNtam which is known as paramAkASam. vaigalum – magizhvu eydhuvar – Will eternally enjoy forever. Leaving behind the samsAram (material realm) where one needs to pray to have continuous experience, will reach paramapadham where there is no break for enjoying bhagavAn. In the next article we will enjoy the next centum. This entry was posted in thiruvAimozhi, thiruvAimozhi 5th centum on September 29, 2017 by Sarathy Thothathri. In the tenth pAsuram, AzhwAr prays to emperumAn saying “I become weakened thinking about your amusing activity of churning the ocean; you should let me know the way to sustain myself and enjoy you”. You remained together with dhEvas and asuras, made arrangements such as mortar, rope and base to churn the fluid in the milky ocean and churned the ocean; the amazing aspects of your assuming the beautiful form of a damsel to let the dhEvas drink the amrutham which appeared there and driving away the asuras; these amazing aspects entered inside my heart and melted my AthmA to become fluid and consumed it [the AthmA]. 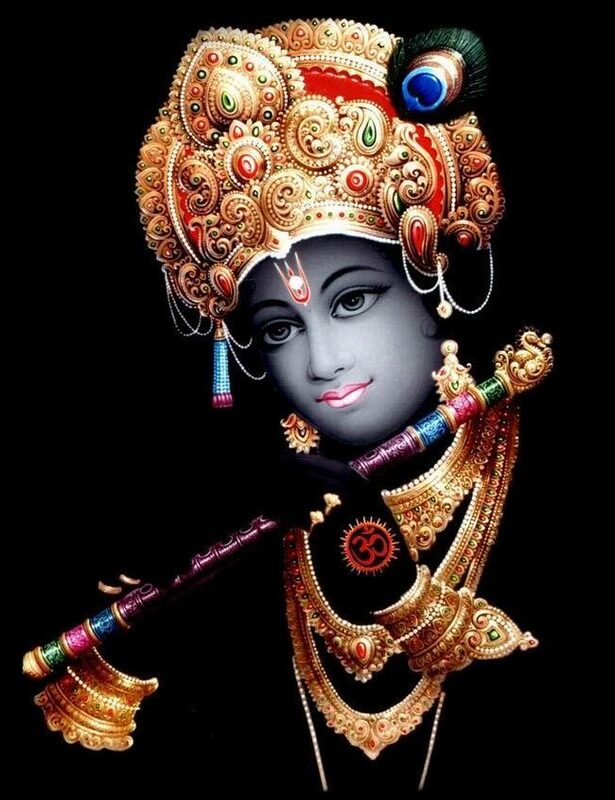 Oh one who is eternally together with thiruvananthAzhwAn who can destroy the hurdles for my experience with you! Mercifully tell me the way to enjoy you eternally. kUdi nIraik kadaindha ARum – The way emperumAn brought dhEvas and asuras together telling them “we will divide the nectar amongst ourselves and consume it”. Only by churning the ocean, emperumAn melted his heart. amudham dhEvar uNNa … – When the result was to be reaped, emperumAn fed the nectar to the dhEvas and made the asuras ignore the nectar saying “throw that nectar to dogs [with disregard]”, by assuming a divine damsel form and have them [asuras] chasing that form – such amazing acts of emperumAn. SrIvishNu purANam “mAyayA mOhayithvA thAn vishNus sthrI rUpamAsthitha:” (vishNu mesmerized the asuras with his mAyA by assuming the form of a damsel). periya thirumozhi 2.6.1 “vAnavaraip peNNAgi amudhUttum perumAnAr” (the great lord who assumed the form of a damsel to feed the nectar to the dhEvas). By the way he churned the ocean and his other amazing acts. Udu pukku – Instead of just being at the outer layer, entering into the inner most layer (heart). enadhu Aviyai – The AthmA which is explained as in SrI bhagavath gIthA 2.24 “achchEdhya: … adhAhya:” (cannot be cut, burnt). urukki uNdiduginRa nin thannai – You who melted me to become fluid and finished me. I became weakened thinking about your auspicious qualities, wondering “why is the purushOththama (best among men) doing like this?”. You should tell me a good means to sustain myself and enjoy you. When emperumAn asks “Can I sustain you?”, AzhwAr responds – Have you not let AdhiSEshan (parambhOgi – great snake, great enjoyer) sustain and enjoy you? Similarly, you should mercifully let me also sustain and enjoy you. This entry was posted in thiruvAimozhi, thiruvAimozhi 5th centum on September 28, 2017 by Sarathy Thothathri. In the ninth pAsuram, AzhwAr says “I have become very weak thinking about your incarnation of thrivikrama. When will I sustain myself and enjoy you?”. kodiya val vinaiyEn unnai enRu kol kUduvadhE? kUduvadhu – will I reach? The way emperumAn humbly requested three feet [of land] so that he [mahAbali] cannot refuse; his predominance of standing right in that yagyavAtam and fulfilling his desire by covering with two feet the deep oceans, the earth which has seven islands and the sky going up to brahma lOkam; every time I hear anyone telling those aspects, my heart is melting and flowing away towards the qualities such as simplicity of yours, who are avAptha samastha kAma yet became a seeker for the sake of your devotee. When will I, who am having very strong unatonable sin in the form of love (to not become broken), reach you to steady myself and enjoy you? adiyai mUnRai irandha ARum – Though these (worldly entities) do not pray for your mercy, not only you show your care towards them, you also ensure that the strong do not trouble the weak. 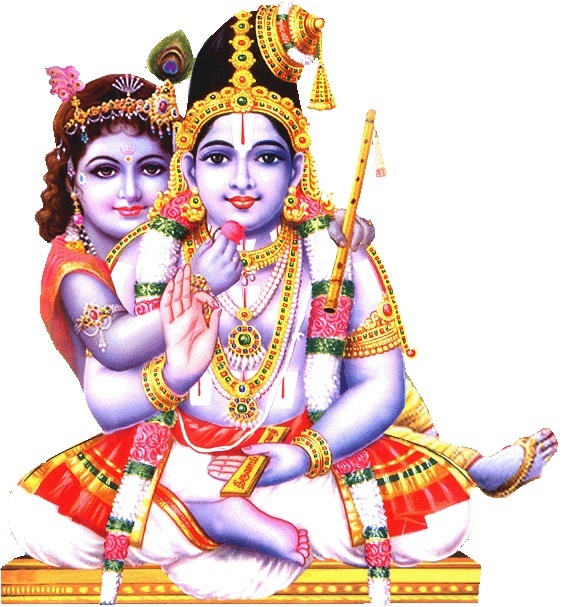 adiyai mUnRai irandha ARum – Instead of directly attacking mahAbali, emperumAn prayed for three feet. Had emperumAn only prayed for two feet, he could not have imprisoned mahAbali [The third step was placed on the head of mahAbali to imprison him]. angE ninRu – If he stepped away from the hermitage where the fire sacrifice was happening, some one could blame him “he cheated” [hence, he scaled the worlds from right there]. Azh kadal … – emperumAn started taking the first step to melt AzhwAr‘s heart. He scaled the earth and the sky in his two steps and covered them all. mukkiyamum – Greatness (predominance). The greatness acquired due to cheating [others] for the sake of his devotees. Alternative explanation – the greatness of having everything other than himself under his divine feet. nodiyumARu … – nodidhal – solludhal (speaking). The great incident of thrivikrama incarnation is narrated by great sages such as vyAsa et al – everytime I hear the way they explain it. I don’t need to speak about it [just hearing is sufficient to melt me]. en nenjam nin thanakkE karaindhugum – I am neither having generosity like mahAbali nor ruling the worlds like indhra; but my mind is becoming very weak towards you. kodiya val vinaiyEn – As said in SrIvishNu dharmam mangalyasthavam “yannAma sankIrthanathO mahAbayAth vimOkshamApnOthi” (On reciting whose names, one becomes freed from great fear), while it is said that chanting of the divine names will relieve one from great sins, I am such a great sinner that, the same [chanting of the divine names] is causing my weakness. unnai enRu kol kUduvadhE – When will I sustain myself and enjoy you? When I reach you to enjoy you? This entry was posted in thiruvAimozhi, thiruvAimozhi 5th centum on September 27, 2017 by Sarathy Thothathri. In the eighth pAsuram, AzhwAr says “Everytime I hear your qualities and activities, I am becoming weakened; what shall I do?”. The way you are reclining with a beautiful divine form, and how four headed brahmA is seated in the lotus flower which is sprouting from your navel and how you are present inside such brahmA [having him as the womb] and created; every time I hear about such activities of yours, who is not having a matching opponent, and those activities which are highlighting your distinct supremacy, my heart remaining focussed, loosens up and tears are falling like waterfall; what shall I do? 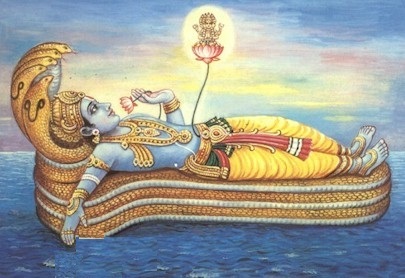 thiru uruvu kidandha ARum – How he is reclining and resting in the causal ocean with a radiant/attractive form. koppUzh … – emperumAn rested in the causal ocean with the intent to engage in creation and when the time was ripe, he created everything. He himself directly created up to the aNdams (universes) and created brahmA in the lotus in his divine navel, being the support for brahmA and subsequently he had brahmA as his support [that is, being the antharyAmi, in-dwelling super soul of brahmA], engaged in variegated creation [creation of various entities such as celestial beings, humans, animals and plants, land masses, oceans etc]. All these aspects overwhelm AzhwAr. thisai mugan karu uL vIRRu irundhu – Assuming the form of chathurmukha (four-headed) brahmA. As said in vishNu dharmam “srushtim thatha:karishyAmi thvAmAviSya” (Oh brahmA! I will enter you and perform creation), and as said in nArAyaNIyam nAmanirvachana adhyAyam “Ethau dhvau vibhuthaSrEshtau” (these two namely brahmA and rudhra are best among dhEvathAs), as said in “having this particular throne” [emperumAn assumed the form of brahmA to engage in creation]. 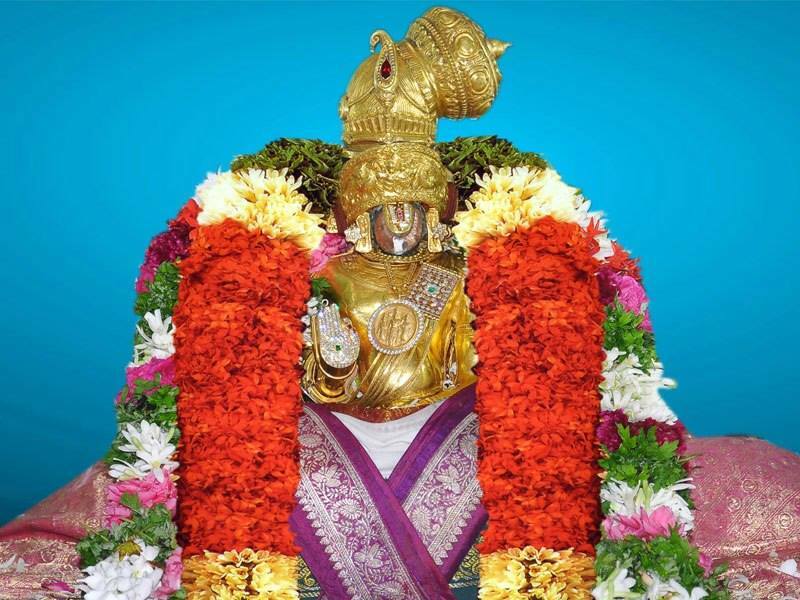 vIRRu irundhu – Being seated manifesting his greatness due to his opulence. Like a precious gem in a golden box. padaiththitta karumangaLum – The activities which were done by emperumAn. poruvil … – Every time I hear about the activities which reveal the opulence of yours, who are matchless and distinguished, my heart loosens like a mountain loosening and tears flow like waterfall from my eyes. en seygEn adiyEnE – Are you letting me, a parathanthran (one who is totally existing for you) to fulfil my own desires? Or can I engage in any other activity to sustain myself? What shall I do? This entry was posted in thiruvAimozhi, thiruvAimozhi 5th centum on September 26, 2017 by Sarathy Thothathri. In the seventh pAsuram, AzhwAr says “Instead of becoming weak by only having internal experience and not seeing you physically, kindly bless me to see you to sustain myself and enjoy you”. kariya mANikkamE – Oh one who is having a form which resembles a blue gem! aruLAy – kindly bless me. Your ways of being present with the form which is shining in my heart and being non-existing due to not being seen physically in a shining manner, you came, stood as shining radiance with darkness; I am becoming weak as my heart thinks about your actions such as your hiding inside me to make my eyes not enjoy you; oh one who is having a form which resembles a blue gem which is the cause for my such weakened state! you should kindly bless me to have firmness in my eyes to see your apt and enjoyable form once. uNmaiyOdinmaiyAy vandhu – oNsudarOdu iruLumAy ninRa ARum – Being truthful towards me, he would remain in my heart in a radiant manner; in my desire to see him externally, he remains non-existing and dark. Alternative explanation – he manifests all his aspects fully for his devotees and remains radiant and measurable by them; for others, he hides all his aspects and make them believe that he does not exist and remains dark to them. For the devotees he remains present with shining radiance and for the others he remains non-existing and dark. vandhu en kaN koLA vagai nI karandhu ennaich cheyginRana – Furthermore, the distinguished interactions of yours towards me. I am neither enjoying your radiance nor seeing the dark, but suffering in the middle. He [AzhwAr] is neither in the group of mukthars (liberated souls in paramapadham) nor in the group of samsAris (bound souls in this material realm), he is standing outside both the groups. Your tormenting of me by entering my heart and yet hiding from my eyes. eN koL sindhaiyuL naiginREn – I am not satisfied with what I have attained [the internal experience]. And I am unable to see the means to attain the remaining aspects [physical vision] with what I already have. I become weak as soon as I start thinking about you. en kariya mANikkamE – You revealed your beautiful form so that I don’t waste my time using my eyes in worldly matters. en kariya mANikkamE – Did you think that those who separated from this form of yours can survive? en kaNgatku – You know the thirst of my eyes; my eyes won’t remain happy, even if I experienced you – they have to see for themselves. They cannot be given something else to keep them happy. thiN koLLa – If you are saying “I have given you internal experience which is as good as physical experience”, I will not accept it. thiN koLLa – I have to firmly see you, and cannot just accept dream-like internal experience. When emperumAn asked “is that possible?”, AzhwAr says “you remained always physically visible to some [for nithyasUris (eternally free souls in paramapadham) and mukthAthmAs (liberated souls), as said in vishNu sUktham ‘sadhA paSyanthi sUraya:’]”. oru nAL aruLAy – He is not saying that it is sufficient to see emperumAn once, but just saying how great his thirst to see emperumAn is; just as a very thirsty person would say “let me wet my tongue with a little bit of water”. AzhwAr is saying “once I attain you, I will let you go subsequently”. un thiru uruvE – Are these [forms, qualities etc] for your sake to carefully hide them! As said in jithanthE sthOthram “na thE rUpam … bhakthAnAm” (your form, qualities etc are not for your sake but for your devotees only). This entry was posted in thiruvAimozhi, thiruvAimozhi 5th centum on September 25, 2017 by Sarathy Thothathri. This entry was posted in Audio, thiruvAimozhi, thiruvAimozhi 5th centum on September 25, 2017 by Sarathy Thothathri. In the sixth pAsuram, AzhwAr says “I who have not seen all your activities, am not even capable of thinking about them; so, you should mercifully make me sustain myself and meditate upon you”. Sixth pAsuram, AzhwAr says “I desired to see all your activities, and am not even capable of thinking about them; so, just as you protected the universe, you should mercifully protect me and make me meditate upon you”. ninaigiRpan – can think about in a focussed manner? oN sudarE – Oh one who became radiant! uraiyAy – you should mercifully indicate. Your ways of standing, sitting, and resting are difficult to think about; I am trying to fully think about the amazing activities of yours, who are not restricted to having a single form, which are tormenting the already weakened heart at every stage; how can I, who am a sinner, think about you in a focussed manner? ; oh one who became radiant by consuming and protecting the universe which was getting destroyed in the deluge! You should mercifully indicate the unique and distinguished means to save me. “ninRavARum, irundhavARum, kidandhavARum” also is explained in context of krishNa standing, sitting and resting in his cradle. ninRa … – Whatever AzhwAr is going through in bhagavath vishayam, we go through the same in worldly matters. A very good singer from North arrived in SrIrangam to worship the divine feet of SrIranganAthan. That day being the thIrthavAri (the concluding day of brahmOthsavam), AzhwAr thiruvarangap perumAL araiyar sang thirumAlai in a melodious tune and praised emperumAn like taming an elephant and had him mesmerized; at the time he requested emperumAn “My lord! A very good devotee of yours has arrived from a distant place to worship your divine feet; you should accept him and honour him”. perumAL obliged and invited him through the archaka; emperumAn mercifully ordered the archakas to perform thirukkaiththala sEvai (archakas carrying emperumAn with their bare hands) from thiruppunnai tree [the divine tree at the banks of chandhra puskhariNi, the ceremonial pond inside the temple campus] up to where the devotee was standing, for a few meters. On completing the act, emperumAn mercifully asked “Is this sufficient for this devotee who has arrived from distant location?” [This explains emperumAn’s divine walking activity]. This is how you should console my heart by mercifully performing some acts. Once, the SrIvaishNava washerman of the SrIrangam temple, washed the divine clothes of emperumAn nicely, dried them, folded them and presented them to emperumAnAr. Being very pleased, emperumAnAr at once took him along to perumAL and told him “My lord! Please see how neatly he has washed your divine clothes”; seeing that, emperumAn mercifully speaks to emperumAnAr “for the sake of this washerman, I am forgiving the washerman of kamsa who committed offense towards me [during krishNAvathAram]”. ninRa ARum … – Standing with the bow in his hand at the entrance of lankA; or standing with the bow in his hand after killing vAli; SrI rAmAyaNam kishkinthA kANdam 19.25 “avashtabya cha thishtantham dhadharSa dhanurUrjitham – SubhA” (thArA saw SrI rAma who is standing majestically holding the bow, along with lakshmaNa and sugrIva) – Due to the bow in his hand [or liking towards him], thArA felt pleased at her heart instead of seeing SrI rAma who killed her husband vAli and standing victoriously, along with lakhmaNa who helped in that effort, and sugrIva who served them and is going to be crowned, as “they are our enemies”. Since vAli was demoniac by nature, he got destroyed by his own actions, just as some one will tie a rock in their neck and jump into a lake to kill oneself, while the lake was built to provide water for everyone. She remained “Did he (SrI rAma) commit any mistake?”. Would emperumAn let live anyone who attacked the one [sugrIva] who is as dear to him as his own life? irundha ARum – Seated as said in SrI rAmAyaNam ayOdhyA kANdam 99.25 “utajE rAmAm AsInam” (SrI rAma who was seated in the hermitage). kidandha ARum – His reclining at the seashore as said in SrI rAmAyaNam yudhdha kANdam 21.1 “anjali prAng muka: kruthvA prathiSiSyE mahOdhadhE” (SrI rAma remained prostrated towards east direction with joined palms). “prathiSiSyE” – it appears that two oceans are present right across each other; kambanAttAzhwAn [poet kamban] said “an ocean of mercy is facing the ocean of water”. That is, the arrow [brahmAsthram] which he launched could have been easily shot by SrI rAma even previously; though he was having such arrow and well built shoulders, he was patiently reclining in front of the undeserving ocean [king] – such reclining is explained by AzhwAr here; while it could have been said “ninRum irundhum kidandhum” [together], AzhwAr said “ninRa ARum”, “irundha ARum”, “kidandha ARum” individually since they tormented him individually. 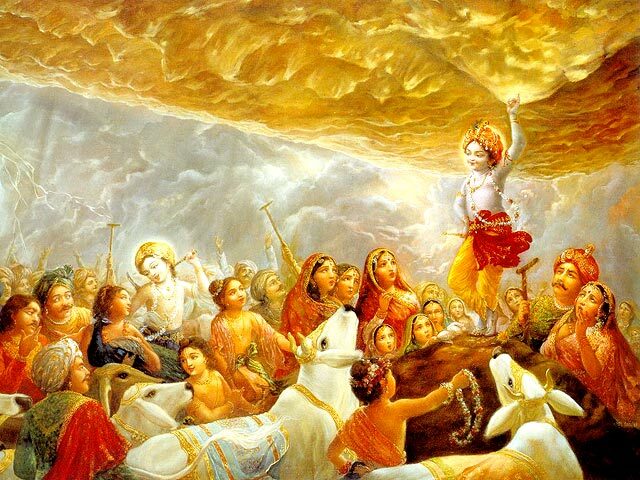 Alternate explanation – krishNa’s lifting up of gOvardhana hill can be considered for ninRavARum, his being together with the cowherd girls before rAsakrIdA can be considered for irundhavARum, and his subsequent resting on the laps of the cowherd girls can be considered for kidandhavARum. When he stands, it is as said in periya thirumozhi 6.9.8 “nilaiyAra ninRAn” (one who is standing firm) and will make one fear for his sitting and reclining postures [that they will be even more attractive]. While he is seated, it is said in thiruvAimozhi 6.5.5 “pirAn irundhamai kAttinIr” (you showed the seated posture of the benefactor, krishNa); when he is reclining, it is as said in thirumAlai 23 “kidandhadhOr kidakkai” (the unique reclining posture). As said in thiruchchandha viruththam 65 “niRpadhum Or veRpagaththirippa viN kidappadhum naRperum thiraik kadaluL“, his standing posture in thirumalA (thiruppathi), sitting posture in paramapadham and resting posture in thiruppARkadal (milky ocean) can also be considered. Another explanation – as said in thiruchchandha viruththam 65 “niRpadhum iruppadhum kidappadhum en nenjuLE” (he is standing, sitting and resting in my heart), in AzhwAr‘s divine heart, emperumAn is standing in AzhwAr’s heart as said in thiruvAimozhi 8.7.5 “thigazhumaNikkunRam onRE oththu ninRAn” (he is standing like a shining hill made of precious gems), sitting as said in thiruvAimozhi 8.7.7 “sevvAy muRuvalOdu enadhuLLaththirundha avvAy anRi yAnaRiyEn maRRaruLE” (I won’t know any other grace than that of the divine reddish smiling lips [of emperumAn who is seated in my heart]) and resting as said in periya thiruvandhAdhi 35 “ninRum irundhum kidandhum” (standing, sitting and resting). Yet another explanation – while AzhwAr thiruvarangap perumAL araiyar explains as said in thiruchchandha viruththam 64 “ninRadhendhai Uragaththu irundhadhendhai pAdagaththu anRu vekkaNaik kidandhadhu” (my lord is sitting in thiruvUragam, seated in thiruppAdagam and is reclining in thiruvekkA), emperumAnAr mercifully explained [matching the context of the padhigam which is focussed on krishNAvathAram], all of these are seen in the cradle [of krishNa]. 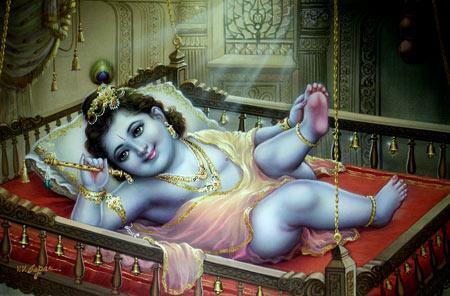 Baby krishNa standing inside the cradle having the beam in the cradle as support, unable to stand after a while falling down and sitting, and even after unable to sit for a while, reclining and falling asleep – are explained here. Yet another explanation, as said in siRiya thirumadal “pOrAr vER kaN madavAL pOndhanaiyum poy uRakkam” (krishNa pretends to sleep until the spear-eyed yaSOdhA leaves), his rising up and standing after she left, his sitting on hearing the sound of her return and reclining on seeing her approaching closer as said in “mun kidandha thAnaththE OrAdhavan pOl kidandha” (krishNa pretending to sleep at the same spot where he was before as if he knows nothing). ninaippu ariyana – Though these incidents occurred once, AzhwAr is unable to think about these even today. He himself previously said in thiruviruththam 98 “imaiyOr thamakkum – sevvE nenjAl ninaippaRidhAl veNNey UNennum Inach chollE” (even for the residents of paramapadham emperumAn‘s butter eating activities are difficult to comprehend). onRalA uruvAy – For AzhwAr, just one such incident is enough to torment him forever. [But here] not just one, many such incidents are present. aruvAya nin mAyangaL – Your amazing activities which are not visible to my eyes. ninRu ninRu ninaiginREn – Neither can he complete thinking about him nor can he avoid thinking about him. I will try hard to think about you, but unable to do so. Alternative explanation – while I desire to think about you, and hence am analysing “which is the means to think about you?”. unnai enganam ninaigiRpan – You who are omniscient and omnipotent, are not showing me the means through which I can think about you. As said in periya thirumozhi 8.2.8 “thoNdellAm nin adiyE thozhudhu uyyumAkaNdu” (Seeing that all your servitors are redeemed by worshipping your divine feet) – that is all servitors, those who are desirous of wealth, those who are desirous of self-enjoyment and those who are desirous of serving your eternally including AzhwAr himself go to emperumAn, pray for what they require, acquire them and leave him after getting their desires fulfilled, went to emperumAn as said in same pAsuram “thAn kaNapuram thozhap pOyinAL” (parakAla nAyaki went to worship emperumAn at thirukkaNNapuram), thinking that “let me also be with emperumAn, enjoy him and return”; would the self see emperumAn only, and should it not see self too? Well, if one is going to emperumAn seeking some benefits, one can return once that desire is fulfilled, but if one goes to emperumAn considering emperumAn only as the goal, there is no way they can return. This is the state of those who have extreme love towards bhagavAn [Here it is explained that, for those with self-interest, they can easily think about emperumAn, pray to him, attain what they need and get back to their activities; but for devotees who are exclusively focussed on emperumAn, cannot even think about emperumAn easily since they don’t have any self interests]. pAviyERku – Except for me [who has sins], everyone else is able to think about you and have their desires fulfilled; everyone in the world as said in SrIvishNu purANam 1.17.78 “smruthO yachchathi SObanam” (one who bestows auspiciousness for those who think about him). onRu nangu uraiyAy – Why can’t you tell me like you told a pacifying statement to arjuna [as in SrI bhagavath gIthA 18.66 “mA sucha:” (do not worry)]? AzhwAr‘s grief is much greater than arjuna’s grief. emperumAn declared “I am responsible for the attainment of the goal and the elimination of hurdles”. That is all which is required, and everything else will naturally follow. The real goal is realizing one’s own true nature, the result of such realisation is kainkaryam [eternal service to emperumAn in paramapadham] and need not be explicitly explained and hence SAsthram stops with highlighting the realisation of true nature [as the initial goal]. Whatever happens subsequent to that is not meant to be explained [it is supposed to be experienced personally]. In this manner, could you not tell me “I will accept responsibility for you”. ulagam uNda oN sudarE – If one consumes food, the body will reflect that. Is desiring to think about, a mistake? Even if such thinking is difficult to do, should you not make that happen? When the universe was in great danger of being consumed by deluge and no one asked you for protection, you yourself consumed it and protected it by placing it in your stomach; while the universe does not realise the favour you did, you considered it as personal gain and remained radiant due to that. ulagam uNda on sudarE – “You protected the universe considering it to be your personal gain” is truly revealed by your radiant form itself. This entry was posted in thiruvAimozhi, thiruvAimozhi 5th centum on September 24, 2017 by Sarathy Thothathri. In the fifth pAsuram, AzhwAr says “Whenever I think about your activities which are done for the sake of your devotees, my mind melts”. You consumed the food which was prepared with intent by the cowherd people for indhra to eat; you lifted the huge gOvardhana hill which is colourful due to the presence of different minerals and protected [everyone] from rain; you initially created the universe, protected it by placing it in your stomach during deluge, spat it out, scaled it, rescued it and united with mother earth who was rescued from the deluge; every time I meditate upon these amazing qualities and activities, my heart is melting like wax in fire in a singular manner. uNNa … – The event where in his birth-place, some people were preparing food to offer to indhra praying for rains, and he ate them. It is due to the jealousy of krishNa thinking “who else can be worshippable in the town where I was born?”; krishNa said “come on! who is indhra! Is one who is not seen by anyone, going to favour us? This being the case, this [gOvardhana] hill which is the shelter for the clouds, having grass and water, and giving place for the cows, should be our worshippable deity”. Since they are cowherds, they would listen to others, and whatever he said could not be refuted; he said “place all your food offerings in front of the hill” and they mounted everything there; he then entered there and ate them all. Giving one’s exclusive belongings to others is similar to a king letting others enjoy the queen’s sweat. indhra along with assistants, was waiting to consume the offering and be satisfied, but emperumAn consumed them all, in between. Out of rage, he started the heavy rains. vaNNa mAl varai … – emperumAn is not someone who gives false promise for protection and shies away from doing that. The act of protecting the cows and the cowherds without even a drop of rain touching them for seven days by lifting up the inconceivable, huge mountain which appears colourful due to many minerals and holding it up, instead of going away after having his desire fulfilled [that is, eating all the offerings]. He also manifested compassion towards indhra thinking “I cannot punish this celestial person indhra; he acted like this due to his anger in losing his food; he himself will give up after a little while; until then let me protect my dependents”. indhra was appointed as the administrator of the earth by krishNa thinking that he is merciful and will protect them; but he became merciless [being blinded by his ego] and ended up committing this mistake. maNNai … – Now, AzhwAr is talking about the favours done by emperumAn towards the whole universe instead of just a town where the residents set out to worshipping indhra. Creating the universe without anyone asking for it, protecting the AthmAs by keeping them in his stomach during the imminent danger of deluge, releasing them thinking “they cannot vanish being inside”, redeeming the universe by scaling it when persons like mahAbali claim ownership, rescuing the earth during intermediary deluge assuming the form of mahA varAha (great wild-boar) and since the earth is the abode of bhUmip pirAtti, doing what is dear to her and uniting with her – such amazing activities. eNNum thORum – AzhwAr‘s eagerness to enjoy these activities is greater than emperumAn‘s protection. AzhwAr will neither think about him [since he is totally weakened thinking about him] nor avoid thinking about him [as he cannot sustain himself without thinking about him]. Just as emperumAn is naturally set out for protecting others, AzhwAr is set out to become finished. en nenju – Worldly people should have also constantly meditated upon these activities and spent their time [but they did not do, only AzhwAr‘s heart was constantly thinking about it]. erivAy mezhugu okkum – Melted like wax placed near fire. ninRE – It is not that it melts sometimes and becomes steady other times, it is constantly melting. This entry was posted in thiruvAimozhi, thiruvAimozhi 5th centum on September 23, 2017 by Sarathy Thothathri. In the fourth pAsuram, AzhwAr says “emperumAn‘s incarnation as budhdha is tormenting me”. Subsequently, AzhwAr says “His act of destroying the demons who were residing in thripuram (three towns), is breaking my AthmA”. See nanjIyar‘s introduction. Previously AzhwAr explained his stealing from favourable ones; here he is explaining the stealing from unfavourable ones. The way in which you assumed the deceptive form [of budhdha] going to thripura and entered there, the way you mingled with the demoniac residents of the town and created confusion in their minds and taking their lives away; the way you remain inseparable from rudhra who is having abundant gangA water in his matted hair to be well known through SAsthram; these aspects engrossed in my intellectual thoughts in my heart and is melting my AthmA into a fluid state. kaLLa vEdaththaik koNdu – As said in SrI rAmAyaNam ayOdhyA kANdam 109.34 “yathAhi chOras sathathAhibudhdha:” (Just as a thief should be driven out, one who rejects vEdham should also be driven out), assuming a mischievous form. emperumAn who is said as in SrI bhagavath gIthA 15.15 “vEdhaiScha sarvair ahamEva vEdhya:” (the whole of vEdham speaks about me), assuming a form which rejects vEdham. Here AzhwAr is thinking the attractive form of budhdha which captures the hearts of those who see him, form which is dark, well built, stretched ears and holding a book. He captures them by his beauty to make them think that there is no other truth beyond what is explained by him. pOy – That is – walking very carefully fearing “whatever I step on will suffer”. While they (followers of budhdha) preach what is contradictory to [vEdha] SAsthram, to make it appear similar to vEdham, they will say “one cannot hurt others; one should not serve lowly entities; one should not speak mischievously; worldly attachment is not good etc”; these words match their deceptive form. perumAL (SrI rAma) mercifully set out to go in exile to the forest, jAbAlika spoke a few words [contradictory to vEdham] convincing him to return to the kingdom; perumAL angrily closed his ears and said “come on! you are arguing in favour of atheism in front of me to eliminate my faith in righteousness! what is the point in blaming you, when I should really be blaming my father who engaged you in his court”; jAbAli responded “my lord! when you return and accept the throne, to have the tears removed from SrI bharathAzhwAn’s eyes, you can see that I change from an atheist to a theist”; at that time everyone hailed as in SrI rAmAyaNam ayOdhyA kANdam 108.1 “jAbAlir brAhmaNOththama:” (jAbAli is best among brAhmaNas); [they further said] since we are wearing yagyOpavIdham, we are known as brAhmaNas; as said in “brahma sambandhI brAhmaNa:” (one who is related to brahmam, is known as brAhmaNa) – and only he is truly having that quality of being related to you. In this manner, jAbAli explained lOkAyatha (baudhdha) philosophy. 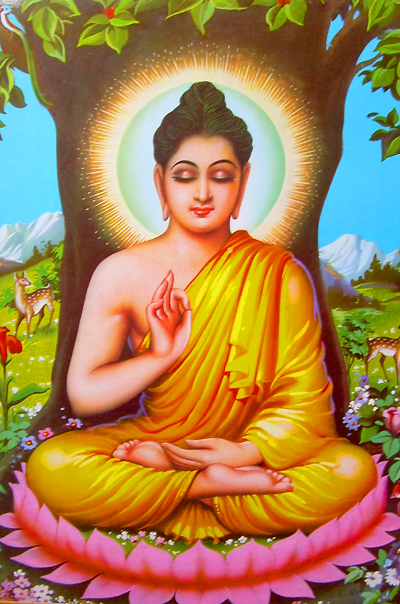 puram pukka ARum – AzhwAr is thinking about the acts of budhdha after reaching the town. That is – since emperumAn is set out to equate vaidhika himsA [hurting which is allowed in vEdham for higher purpose] to sAmAnya himsA [hurting which is done without the sanction of vEdham], he walks carefully even while stepping over grass, not to hurt it. kalandhu – He mingled as one amongst them and preached to them. To gain their trust, he mingled with them completely. asurarai uLLam bEdham seydhittu – He preached them avaidhika [contrary to vEdham] philosophy and eliminated their faith in vEdham. Did they have faith in vEdham? It is said in SrI rAmAyaNam “agnihOthrAScha vEdhAScha rAkshasAnAm gruhEgruhE” (fire sacrifices and reciting of vEdham is seen in every rAkshasa’s house). Everyone has some good aspects. emperumAn caused confusion in their minds and eliminated whatever faith they had in righteousness [only after faith in vEdham is eliminated, they can be easily defeated]. uyir uNda upAyangaLum – The ways through which he finished them. Eliminating their faith in vEdham, he made them to be as good as dead bodies and can be easily defeated even by a bikshuka (beggar) and can have him glorified saying “I killed them”. Though emperumAn did all of these, he ensured that he is not glorified for it! 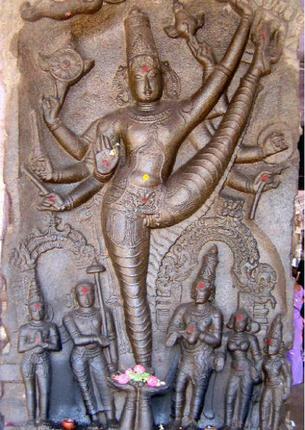 mahAbhAratham karNa parvam “vishNurAthmA bhagavathO bhavasya amithathEjasa: thasmAth dhanurjyA samsparSam savishEhE mahESvara:” (The omnipresent vishNu is the antharyAmi for Siva who is infinitely valourous and worshippable; due to this fact, Siva was able to launch the arrow on the bow during the destruction of the three towns). For sarvESvaran, there is no difference in getting things done through a chEthana [rudhra] or achEthana [bow and arrow]. For emperumAn, there is no difference between rudhra and the bow in his hands. This is similar to how emperumAn has chith and achith as the material cause in subtle state to effect their gross state [during creation, the souls and matter from subtle state are transformed to gross state by emperumAn]. Previously, rudhra tried to accomplish this himself; but he could not do it, and then emperumAn as antharyAmi helped him accomplish it. Once a king had “rudhra is supreme” written in a palm leaf and ordered the scholars to accept it and sign it. While many obliged, one scholar [kUraththAzhwAn] said “come on! can you establish rudhra’s supremacy by preserving the palm leaf! SAsthram is explaining that the greatness of your dhEvathA is due to sarvESvaran’s will; that being the case, I may write and agree what you say; but long after our time, a scholar may see this and will say ‘who is this fool to have written and signed this?’ and I don’t want to be laughed at; so you can do whatever you want”. upAyangaLum – AzhwAr is thinking about emperumAn‘s different thoughts from back then. veLLa nIr … – thirumAlai ANdAn explained as heard from ALavandhAr – this is explaining emperumAn’s mischievous act of being present amidst brahmA and rudhra. That is, emperumAn appearing to be at par with brahmA and rudhra. emperumAnAr mercifully heard this and said – that is nice; but do we have to go back in time so far? just see his great favour while destroying the three towns – is there any limit for such favours? is this not sufficient? veLLa nIr … – Your being present appearing inseparable from rudhra who is having gangA water in his matted hair. That is – rudhra being SarIram (body/form) for emperumAn. Why should it be explained like this? Why can’t rudhra be explained as the same as vishNu? If we did that, the statement “vishNurAthmA” will become useless. periyAzhwAr thirumozhi 4.7.2 “nalam thigazh sadaiyAn mudik konRai malarum nAraNan pAdhath thuzhAyum kalandhizhi punalAl pugar padu gangai” (the gangA river which is shining with the water flowing down carrying konRai flower from the pious rudhra who is having matted hair and the thuLasi from the divine feet of SrIman nArAyaNan). AzhwAr is saying “this flooding gangA river is the proof for rudhra’s servitorship and emperumAn’s lordship”. The konRai flower from the matted hair of rudhra and thuLasi from the divine feet of sarvESvaran are coming together. uLLam uL kudaindhu – Entering into my heart and overwhelming it, and tormenting the AthmA which is said in SrI bhagavath gIthA 2.24 “achchEdhya: … adhAhya:” (cannot be cut, burnt). Entering through the mind which is the gateway for knowledge and melting the AthmA into fluid and finishing it. This entry was posted in thiruvAimozhi, thiruvAimozhi 5th centum on September 22, 2017 by Sarathy Thothathri. In the third pAsuram, AzhwAr says “Your childhood activities are greatly tormenting me”. See nanjIyar‘s introduction. AzhwAr is explaining further what was mentioned in first pAsuram “vaLarndhavARu” (the way emperumAn grew up) saying that he grew up sustaining himself with the life of the enemies and the materials which are touched by his devotees. Your act of consuming milk from the bosom of the demon who is having flower decorated hair, in a childish act, while clearly knowing it is not your mother’s bosom; your childish valourous act of mercifully kicking the wheel possessed by the demon, by your reddish divine foot, to be thrown up and be finished; your act of standing with fear and tears flowing from your lotus like eyes which match your stature when mother yaSOdhA held a stick when the discussion about your eating of ghee came up; these acts are coming up to me and are melting my desirous heart. peyyum pUm kuzhal pEy mulai uNda – AzhwAr is explaining further what was mentioned in first pAsuram “vaLarndhavARu” (the way emperumAn grew up) saying that he grew up sustaining himself with the life of the enemies and the materials which are touched by his devotees. 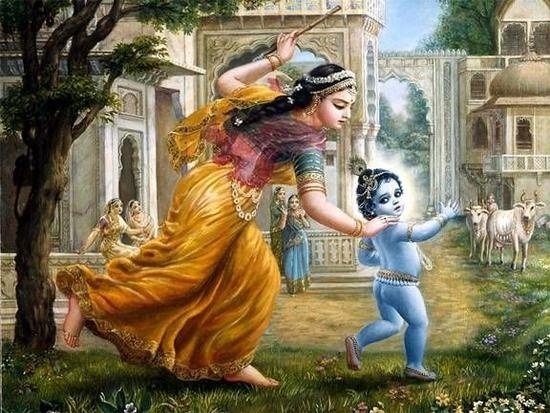 Mother yaSOdhA gave a bath to krishNa, decorated him, made him sleep and went away. At that time, pUthanA arrived. peyyum pUm kuzhal – This can be considered as an adjective for “piLLai” (baby krishNa); alternatively, it can be seen as an adjective for “pEy” (demoniac pUthanA). She decorated herself and arrived there only to be killed. The mothers usually would decorate themselves nicely to avoid upsetting their toddlers. So, she too decorated herself nicely; she is said in periya thirumozhi 1.3.1 “peRRa thAy pOl vandha pEychchi” (she came dressed like his mother). The demon which was having hair decorated with flowers. pEy mulai uNda piLLaith thERRamum – Instead of having knowledge about his control over everything etc, here it is talking about the knowledge of distinguishing between mother’s bosom and others’ bosom. Even at very toddler state, the babies would know their mothers’ bosom. Still, emperumAn consumed the milk considering her to be his mother. piLLaith thERRamum – His clarity in that toddler state. That is – he performed the acts towards pUthanA which he would normally do after being pleased on consuming milk from mother yaSOdhA. He both knows and knows not that she is dangerous for him, and his nature is such that whoever is inimical towards him, when they approach him, they will naturally be finished. Or sAdiRa – It [the wheel] cannot even be doubted to be inimical. At least in the case of pUthanA, one can doubt who she is, but this wheel was placed as protection for him. When some one sees [real] yaSOdhA, one would at least doubt the identity of pUthanA. Or sAdu – There is no comparison for the enmity of the wheel towards krishNa. iRa – To break. As said in thiruvAimozhi 6.9.4 “thaLarndhum muRindhum …” (weakening and breaking into pieces). seyya pAdham – Reddish divine feet. He eliminated the enemies using my [AzhwAr’s] life. His life is always resting on emperumAn‘s divine feet. onRAl – We cannot say which divine foot he used. It is not that he was doing it with hatred/intent. seydha nin siRuch chEvagamum – This is how you set out to perform valorous acts. As SrI rAma, you appeared as a prince, attained the right age, learned weaponry, followed vaSishta et al, acquiring weapons from viSvAmithra et al and then only destroyed thAdakA, mArIcha, subAhu et al; all of those are happening without reaching mature age, here in krishNAvathAram, with the mouth and feet. For one whose mouth is capable, he does not need anything more. There is no one who has stronger feet than him. That is why a flag is hoisted on his feet as said in sthOthra rathnam 31 “dhvajAravaindhAnkuSavajralAnchanam | thrivikrama! thvachcharNAmbujadhvayam” (Oh my lord who incarnated as thrivikrama! Having Sankha (conch), chakra (disc), kalpaka vruksha (kalpaka tree), dhvaja/kodi (flag), arvaindha/thAmarai (lotus), ankuSa (hook), vajrAyudham (a weapon) as identity! your two divine feet). Even at that time, it was his divine feet which rose against everything as said in thirunedunthANdagam 5 “avuNan uLLahthu eN madhiyum kadandhu aNdamIdhu pOgi” (reaching beyond the thoughts of the demoniac king and up to the end of the oval shaped universe). ney uN … – Just as he frightened his enemies even in his childhood, as he grew up, he was fearing his devotees. ney uN vArththaiyuL – Mother yaSOdhA had placed the ghee safely with specific markings and had gone out; on returning she noticed that the markings were changed and said that it was stolen; at that time, krishNa started looking at her with fear. annai kOl koLLa – Being a child, he does not understand that it was just his mother who has taken up the stick; it was her own words in periya thirumozhi 10.4.8 “un tham adigaL munivar” (Your father will be angry) – dear child, if your father hears about your actions, he will be angry; her anger is as said in “unnai nAn en kaiyil kOlAl nondhida mOdhavum killEn” (I cannot beat you with the stick in my hand, to hurt you); for one who is capable, they can use this stick to punish you and stop you from engaging in mischief further, but I am not capable to do so. As said in periya thirumozhi 8.3.5 “thAy eduththa siRu kOlukku uLaindhOdi” (fleeing out of fear for the small stick (straw) which his mother took up to beat him). He does not realise that his mother just tries to frighten him and even if he was beaten with that stick it will not hurt. [krishNa’s thinking] Even if the father takes up a stick, one can relax since it is apt due to his being intent on krishNa’s well being. But if the mother who is always showering love, takes up a stick with anger, he could not bear it. But why did mother yaSOdhA do this? When the ghee was stolen, there is no one to stop her anger which will make her take up the stick to beat him. nI un thAmaraik kaNgaL nIr malga – As it is you deserve to be enjoyed, and if your eyes are well blossomed [like a lotus flower], shall we be patient! un thAmaraik kaNgaL – Eyes matching your stature as said in SrI rAmAyaNam sundhara kANdam 16.15 “rAghavOrhathivaidhEhIm” (SrI rAma who matches sIthA). It is said in thiruvAimozhi 5.5.5 “thakka thAmaraik kaN” (matching lotus like eyes). paiyavE nilaiyum – When she lifted the stick in her hand to beat him, his state of looking at her and shedding tears, becoming pale and being anguished. Alternative explanation – when fearfully looking at her face, his mischievous acts being restless due to neither being able to step back nor being able to stay put. vandhu … – These acts are tormenting me. At least you can escape from your situation, but in my case, they chase me wherever I go and torment me. paiyavE nilaiyum vandhu en nenjai urukkum – AzhwAr says – They are binding my feet to make them not step away. nenjai urukkum – This is how those acts banged on AzhwAr’s heart. urukkum – This is how emperumAn melted AzhwAr’s heart. This entry was posted in thiruvAimozhi, thiruvAimozhi 5th centum on September 21, 2017 by Sarathy Thothathri.